Hair loss is common; much too common. It is remarkable how many men lose their hair, but it often occurs to women as well. The causes of hair loss vary greatly. It can be anything from hormonal changes to illness. The most common cause, though, is a hereditary predisposition. If your father or mother suffered from hair loss, there is a great chance you will have it as well. Unless…you can break the hereditary tie. Is it possible to break the hereditary predisposition? Step 3 of the MIR-Method is one of the ingredients with which you are able to break hereditary ties. With “Detach father. Detach mother”, you detach yourself from your father and your mother and even from the whole family line. In addition, you can improve the production of your DNA when you rid yourself of its emotional burden. I mean with this that if one of your parents, or grandparents, experienced something terrible, there can be an emotional blockage to the forming of perfect DNA because the building blocks, nucleotides, are produced in a different order. Look at it this way. Every time you get rid of old emotional burdens within yourself, all of your body’s cells get a new chance to repair or reform themselves! How far can the MIR-Method go? It is still a question as to how far the MIR-Method can go in breaking hereditary ties and whether it will work for everyone, but the initial stories of results are very promising. One of the MIR-Method coaches indicated that her hair is growing back. And below you can read a story from England. Lucienne writes: “I wanted to share the following with you. An acquaintance of mine, here in England where I live, began to suddenly experience hair loss and had no idea why this was happening. She went through various testing and finally, the hospital couldn’t explain it, was only able to say that it was alopecia. She was sent home with the message that nothing can be done about it. She is losing all of her hair and has started buying and wearing wigs. 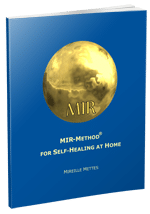 When I spoke with her about this, I told her about the MIR-Method and gave her your card so she could look at the website and read about it in English and maybe start doing the 9 MIR-Method steps. She started and what do you think has happened? Her hair has started growing again. I just saw her and asked how things were going because before the summer vacation she had some growth but it didn’t cover her whole head yet. But now she told me that it’s growing everywhere. During the fall vacation she is going to Rhodos and is planning not to wear her wig at all. In November, she was supposed to have steroid injections in her scalp but she says that she doesn’t want them anymore and that she doesn’t need them. This happy result can be found here. One form of hair loss is “Alopecia Areata”. In this case, hair loss is sudden, as described above by Lucienne. In my clinic, in 2008, I met a young man with a perfectly round bald spot on his head, which had developed in the space of just one night. There was a strong indication that his body was housing too much electricity. Our bodies have a lot of electricity and this electricity builds up with some people. This young man often took hold of heating elements to diffuse this surplus electricity. One of the MIR-Method steps is step 2: “Detox all toxicity”, with electricity being one of the toxic burdens. By doing the MIR-Method, you help your body to release the surplus of electricity. It would be fascinating to me to do further research about whether a surplus of electricity is the real cause of Alopecia Areata. Who knows, maybe one of you can tell us more about this from personal experience. I’d love to hear about it! How long should I do the MIR-Method? If hair loss is a problem for you, assume that you will need to do the MIR-Method for a long period of time. Your body has to work on many levels: supplementing nutrients, balancing your hormone system and getting rid of your own deep, old traumas or those of your (grand)parents. That takes time, months, maybe over a year. But that’s all right. If you give yourself the opportunity to stimulate renewed hair growth, it’s worth it all. The MIR-Method works in many ways. I’ve had reports about its effect on hair. Not as oily, shinier, that it looks better. These are all small indications that there are improvements in your scalp and along with that, in the quality of your hair. I’d be really interested to learn what you noticed about your hair! How is your hair? I’d love to hear of any improvements you have noticed in your hair condition due to doing the MIR-Method. Please write about it below. Thank you very much! I wish you much success with your hair and with your general health! My father and his parents died of cancer at younger age.Im afraid that it is hereditary. I live in fears that i will die young and because of it Im afraid of marriage and having kids. Is it possible that the MIR-Method could break the hereditary tie? Yes, I completely understand your fear! The MIR-Method can really help you with this. First of all it will help you to let go of that fear and start to live your life. The sadness of missing out on a marriage and children is far greater than your fear of cancer. Second: it is really questionable whether cancer is hereditary. New science has proven that the causes of cancer are not hereditary. If you want to study, start at Bruce Lipton or Gregg Braden. Let me know if you need more. And… science is very forward in healing methods, so in a few year’s time they will discover new ways of treatment. Please let go of your fears and have a use the MIR-Method to help you do that. Do we need to specify any specific issue before starting the MIR Method or just start off generally to heal many issues at a time? If you can be patient about your healing, I prefer people to only do all 9 steps. If you put an extra step before the nine steps, you make your subconscious work on your wish, which may not necessarily be the best for you as a whole. My father is staying about 50km away from me and he has been detected of parkinsons problem from past 3 yrs. He is 84 yrs. I cant stay with him but want to help him so I am doing MIR from distance only. But he is not getting any benefit out of it. Please mam tell me how to do it so that his problem is relieved. Did you ask your father for permission to treat him with the MIR-Method? If so, just continu doing it, because it takes several months before you may notice any progress. Hope to hear from you how he is doing!